The recovery which began in the comics industry in late 2000 is continuing, with 2005 now projected to be the fifth consecutive year of overall sales growth, according to my analysis of the October 2005 sales reports released by Diamond Comic Distributors on Nov. 11. Diamond's sales of comic books, trade paperbacks, and magazines to North American retailers are on pace for a $352 million year, up from $328 million in 2004. We're up 7% year-over-year for the first ten months, and it would take a cataclysmic holiday sales season to prevent a positive performance. 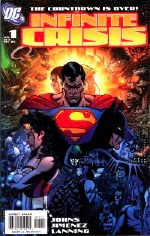 Overall comics, trade, and magazine sales are estimated at $288.42 million through October 2005, versus $269 million through October 2004. A growth rate of 7%, if it holds, would be slightly better than 2004's 6% rate, an improvement over 2003's sales of $310.6 million. It might not be the double-digit gains we were on pace for earlier in the year, or like we saw in 2002, but it's better to be in a class with 2004, which saw modest growth, than 2001 or 2003, in which the industry eked out the narrowest of gains. And they all beat anything we went through in the mid- and late-1990s, when there were minus signs attached to everything. Helped by the estimated 249,100 copies of Infinite Crisis #1 ordered by retailers, DC managed a rare feat, leading Marvel in every single category I calculated: Top 300 Comics units, Top 300 Comics dollars, Top 300 Comics plus Top 100 Trades, and the Overall category, which includes backlist trades and comics not in the Top 300. While it came close in May of this year, DC last led Marvel in all calculations in August 2000. Observers will note that there aren't many high-profile DC products in that month's listing, but where it surpassed Marvel was in volume of releases. In August 2000, DC placed fully twice as many comics in Diamond's Top 300 as Marvel did, 98 to 49. This was right at the end of the comics recession and preceded the increase in Marvel's number of offerings. By contrast, in October 2005, DC ranked 91 items to Marvel's 78. Since Marvel has often been able to outsell DC in units despite having fewer offerings, this change suggests that DC is digging into Marvel's per-title performance advantage. However, he said those figures can be hard to interpret. When it comes to computing per-title sales averages for publishers -- comics' version of baseball's "slugging percentage" -- it's necessary to drop out reprints, reordered titles that make it into the Top 300 a second of third time, variant covers and other things that might be oranges to the apples of titles receiving initial orders. Doing that, DC appears to have had 80 first-time items in October, averaging 32,000 copies each, where Marvel had 69 first-time offerings averaging 36,700 copies each. It does suggest the old axiom of the random Marvel selling one-and-a-half times the copies of the random DC is no longer accurate, now that Marvel's line has grown to include kids' titles and subgenres that aren't necessarily at the top of the charts. On the other hand, it's the presence of that new material that's helped make the difference between the recession of 2000 and the recovery of 2005. Comics unit sales: The Top 300 comic books had retailer orders of 6.12 million copies in October, 3% more than October 2004, which had the same number of shipping weeks. There were only two publishers new to the Top 300. Zenescope was the highest ranking publisher debut, with its Grimm’s Fairy Tales #1 placing 197th with approximately 6,100 copies ordered. The first comics product from Bill Jemas’ new firm, 360ep, placed 242nd with approximately 3,400 copies ordered. The issue, Advent Rising: Rock Planet #1, is based on the Majesco video game. For the first 10 months of 2005, the Top 300 comics from each month have sold a combined 63.1 million copies, an increase of 3% over the same period in the previous year. Comics dollar sales: The Top 300 comic books had sales worth $18.16 million in October, 6% more than in October 2004. For the first 10 months of 2005, the Top 300 comics from each month have sold a combined $182.35 million, an increase of 4% over the same period in the previous year. Trade paperbacks: The Top 100 trade paperbacks and graphic novels reported by Diamond had orders worth $3.76 million at full retail in October. Adding those to the Top 300 comics for the month yields $21.91 million, an increase of 2% over October 2004. For the first 10 months of 2005, the Top 300 comics and the Top 100 trade paperbacks from each month had orders worth $219.6 million, up 5% over the same period in 2004. Among trade paperbacks, Vertigo First Offenses was the top seller. Essentially a DC 100-page giant at $4.99, its inclusion in this category is unusual, since similarly sized items (and at higher prices) have been customarily been classed by Diamond with the comic books. It’s not unprecedented, however, as Diamond has classed a handful of periodical-like items before with the trades — usually items likely to be listed on the Star System for reorders. The Top Cow Collected Editions from several years back were smaller still, for example. Now, as it has on those occasions, it is likely to feed fuel to the debate about what physically constitutes a comic book as opposed to a trade paperback. Marvel Must Haves, for example, are today categorized with the comics, despite being the size or larger than the Top Cow editions which once were listed for a time as trades. Overall: Diamond publishes dollar market shares for its top 20 publishers across all comics, trade paperbacks, and magazines. Knowing the exact total orders of any publisher on that list right down to the oldest backlist item allows you to calculate Diamond's total orders across these product groups. The October 2005 total was $29.11 million, which increases to $32.44 million, when Diamond's United Kingdom orders are added. The figure is 4% over October 2005. Again, overall, the last 10 months stand at $288 million, up 7% over the same period in 2004. Note the nearly $70 million difference between the "overall" grouping for the year and the Top 300 comics plus Top 100 trades grouping. While there are magazines and comics below 300th place each month in there, most of this money is coming from trade paperbacks below 100th place: the ever-growing backlist. It can be argued that two-thirds of trade paperback dollar sales are now in that region not reported on Diamond's charts. Market shares: Again, DC led Marvel in Diamond's reported overall unit and dollar market shares. Image again led Dark Horse in narrower categories but was surpassed in the overall category. Apart from the DC/Marvel reversal, little movement can be seen in the market shares in October; in fact, 19 out of last month’s Top 20 dollar suppliers for comics, games, and magazines appeared in this month’s Top 20 list. Price analysis: The average comic book on Diamond's Top 300 list cost $3.20, up from $3.05 in October 2004. The weighted average price — that is, the cost of the average comic book Diamond sold — was $2.96, up from $2.88 last year. The average price of the comics that made the Top 25 was $2.74, up from $2.68 in 2004.